As much as I love my grandma’s recipe for banana bread, the large quantity of butter makes it more “special occasion” than everyday. 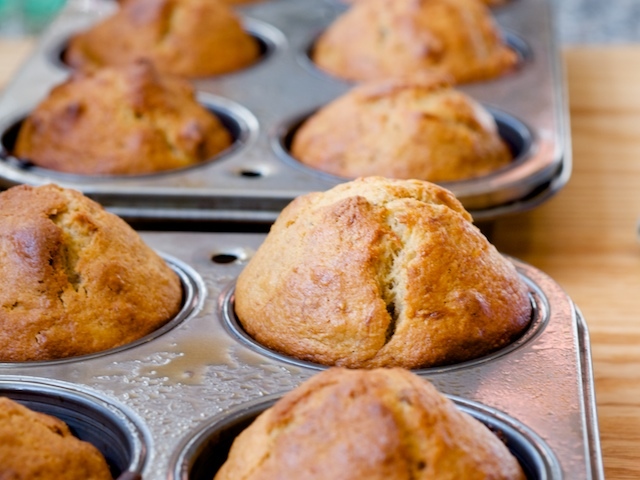 This recipe is the outcome of my efforts to make a lower-in-fat banana bread, one that makes a delicious breakfast or afternoon snack, which I bake in muffin tins. For banana bread, cook the batter in a buttered and floured loaf pan at 350 degrees for about 50 to 60 minutes, testing for doneness with a toothpick after 50 minutes. In a medium-large bowl, stir together the mashed bananas, citrus zest, and juice until smooth. Add the oil, brown sugar, and eggs, and mix well. In a smaller bowl, whisk together the flours, salt, baking powder, and baking soda. Add the dry ingredients to the bananas and stir until combined. Stir in the nuts if using. Spoon the batter, which will be quite thick, into a buttered muffin tin. Bake for 20 to 25 minutes. Insert a skewer or toothpick into the center of one of the muffins; if it comes out clean (not gooey), the muffins are done. Cool briefly in the tins, then turn out onto a rack to finish cooling. Serve warm or at room temperature. If you (or your kids) prefer, replace the walnuts with 1 cup chocolate chips.